Six of the seven species of sea turtles are threatened, and on beaches around the world, organisations and volunteers are working to protect them and their habitats. One of the conservation methods is a hatchery. This is when the eggs are moved from their nests to a safer part of the beach, they are labelled, and staff and volunteers watch for hatchlings to emerge. However, hatcheries come with their own risks. Moving eggs is a tricky business that must be overseen by experts, as is the handling of hatchlings. Some hatcheries in Sri Lanka use tanks to house the new hatchlings, a process known as ‘headstarting’. Hatcheries claim that this allows the baby turtles to build up their strength and grow before they begin their journey to the open ocean. But research has shown that the use of tanks can in fact harm the turtles, and in some cases they are used to draw in paying tourists who can pick up and play with the hatchlings – making us question the real aim of the hatchery. No genuine conservation organisation would ever encourage the handling of wild animals for fun and photos. Our campaign wants to ensure that hatcheries are set up with the turtles’ best interests in mind, to ensure these animals do not become extinct. Each year, thousands of travellers visit or volunteer in sea turtle hatcheries, where sea turtle eggs are moved to safer places on the beach to protect them from predators, poachers, erosion and other dangers. While some hatcheries are doing incredible work, others are sadly more focused on profit than conservation. One of the red flags is the presence of tanks – which enable hatchlings to be played with, handled and photographed by tourists. Filled with turtles, in a tropical climate, it is no surprise that the tanks can easily spread diseases and bacteria. When the hatchlings reach the sea, these can be spread to wild turtles. And swimming for days can exhaust the hatchlings before they even reach the open water. On some occasions, adult turtles are kept in tanks for years, as little more than playthings for tourists. In 2017, Responsible Travel received a concerning review from one of our travellers who had volunteered at a hatchery in Sri Lanka. Although she had a great time, she was very worried that she had done little to actually help protect sea turtles, and that in fact the hatchery could have been profiting from tourists without actually contributing to conservation. We went on to investigate sea turtle hatcheries, and based on the evidence from various marine conservation organisations, we decided to remove any with tanks from our site. A tiny hatchling emerges from her nests to be scooped up by volunteers and placed in a concrete tank filled with water. Swimming round and round for days or even weeks, she uses up the energy reserves that are designed to help her make her way into the open ocean. 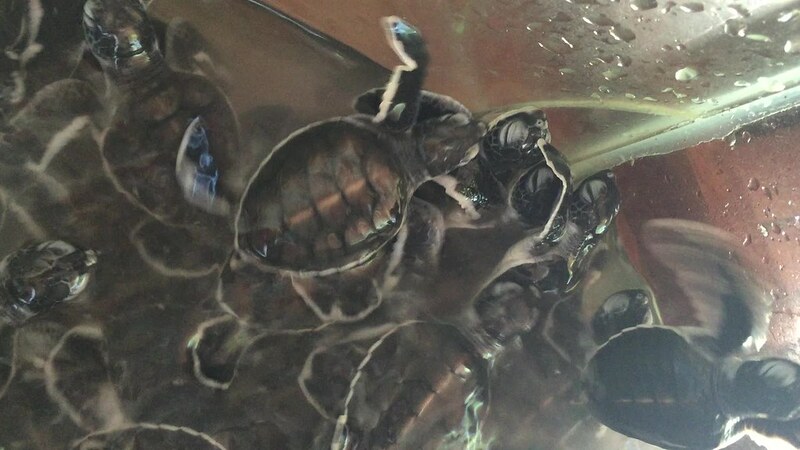 As more hatchlings are added to the tank, along with food and excrement, diseases flourish. Each day, tourists arrive and are encouraged to pick up the hatchling to play with her and take cute photos. The turtle becomes distressed, and is surrounded by harmful bacteria. When she is finally released, she is weak. She makes it out to sea, but the bacteria she carries may be spread to other sea turtles she encounters. There is a risk that, having been in the tank for so long, she may not have ‘imprinted’ the location of the beach on her memory. This is essential, as in decades to come she will need to return to the same beach to lay her own eggs. Unfortunately, as the turtles spend at least ten years out at sea before returning to shore, the damage caused by the tanks may not become apparent until hundreds more hatchlings have been through the process, and the same mistakes have been made. Ditching tanks does much more than benefit the turtles. It also spreads the important message that these are wild animals, which cannot be kept in captivity purely for our entertainment. The presence of tanks means tourist can handle the hatchlings and take selfies – this is completely wrong. Seeing a hatchling or a nesting mother in the wild is not such an interactive experience; it will be nighttime so you may not get to take photos, and you certainly won’t get to touch them. But these are wild animals and seeing them at such important stages of their life – laying eggs or hatching – is a privilege, and is ultimately far more fulfilling than seeing them in a concrete tank. If you have visited a hatchery with a tank, leave reviews and photos on TripAdvisor, share on social media, and spread the word so that more people are aware that these ‘conservation’ centers are nothing of the sort. We carried out our research into sea turtle hatcheries as the result of a bad review – negative publicity really does work! Volunteer with an organisation with is tackling the root causes of the issues that sea turtles face. Maybe they organise beach clean ups, or night time patrols to deter poachers. They might monitor and collect data on mother turtles and their nests, work with local communities to educate them about conservation, and run conservation lessons in schools. These efforts will combine to ensure that hatcheries - with or without tanks – aren’t needed in the first place! You can read our guidelines, and find out which questions to ask to ensure you are volunteering at an ethical sea turtle hatchery, on our Sea turtle hatcheries page. Taking advantage of unsuspecting volunteers to work for and fund projects which don’t actually benefit wildlife is not just environmentally damaging, it is a gross abuse of trust. Volunteers and tourists need to have confidence that the places they are visiting and working in are genuinely supporting turtle populations. The best way to do that is to stop using tanks, and reinvest this time and energy into solving the issues that affect sea turtles, from pollution and poaching to development and fishing practices.